“There’s nothing else like this,” says NIH postdoctoral fellow Alika Maunakea during a visit to the National Library of Medicine’s new exhibition, Native Voices: Native Peoples’ Concepts of Health and Illness. The exhibition explores health and medicine from the perspective of contemporary American Indians, Alaska Natives, and Native Hawaiians. 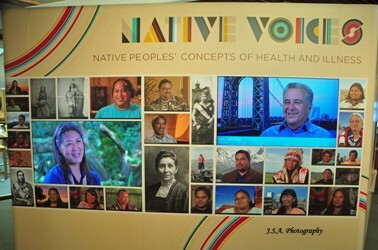 “America’s Native population has a lot to teach themselves and the rest of us,” says NLM Director Dr. Donald A.B. Lindberg. Honoring the Native tradition of oral history, the exhibition features interviews with Native people who provide insight into topics such as the role of nature and spirituality in Native health and the relationship between traditional healing and Western medicine in Native communities. Visitors also can explore art and artifacts including a 20-foot tall healing totem and a model of the famous voyaging canoe Hōkūle‘a. Post doc Maunakea, a Native Hawaiian, says the exhibition is the most comprehensive collection of information honoring Native medicine and health he’s ever seen. He specializes in epigentics research at the National Heart, Lung and Blood Institute and says his great grandmother was instrumental in his decision to study biology. She was a healing medicine practitioner who taught him about nature and health. “It’s not just something I grew up with. It’s complementary to what I do professionally,” he explains. On the weekends, Maunakea teaches Hawaiian language at an Arlington, VA-based school dedicated to preserving Native Hawaiian culture. When he and school leaders learned about Native Voices, they arranged special tours for the students. “This exhibition is precious to us because it’s tied to our culture,” says Ku’ulei Stockman, principal of the school, Hālau O ‘Aulani and Director of Cultural Resources of Pacific Center for Economic Development, a not-for-profit Native Hawaiian Organization (NHO) established to advance and promote the economic welfare of the Native Hawaiian Community. NLM has a history of working with Native communities as part of its commitment to make health information accessible to people no matter where they live or work. The concept for the exhibition grew from numerous meetings with Native leaders. Native Voices is a compelling chorus that includes the views and experiences of young people and elders; traditional healers and MDs; artists and government leaders. For example, visitors can learn from one of the Native American Code Talkers who played a vital role during World War II, or hear from the navigator whose Hōkūle‘a voyages made him a cultural hero. Visitors can listen to interview clips on touch-screen displays throughout the exhibition, or sit down at an iPad station and access extended interviews and written transcripts. In addition to interviews, art and objects, the exhibition includes an interactive timeline and a reading area with books and newspapers. The exhibition, on the first floor of the Library (Building 38) is open 8:30 a.m.-5:00 p.m. Monday-Friday, except federal holidays. People can view the exhibition independently or request a guided tour by calling 301-594-1947 or completing an online request form. Welcome wall at the entrance of the Native Voices exhibition, which opened to the public October 6, 2011. Photo by J.S.A. Photography. A healing totem that is part of the exhibition was installed in the herb garden in front of the Library. The totem is the work of master carver Jewell Praying Wolf James and the House of Tears Carvers in Washington state. 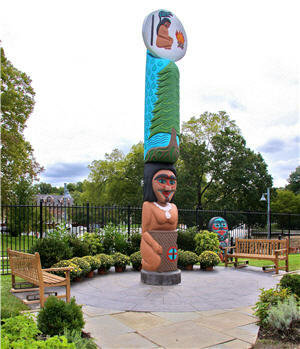 Numerous Indian tribes blessed the totem as it travelled across the country to the Library. Photo by Fran Sandridge. NLM Director Dr. Donald A.B. 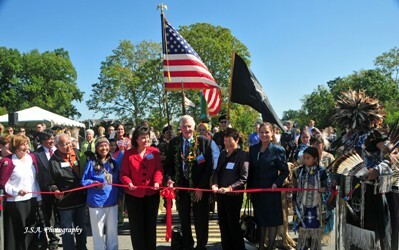 Lindberg cuts the ribbon to open the exhibition with the help of IHS Director Dr. Yvette Roubideaux (to his immediate left) and other dignitaries. Photo by J.S.A. Photography. 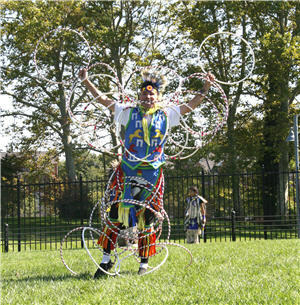 Ceremonial dancing and a blessing for the healing totem were part of a special opening program October 5, 2011. Photo by Fran Sandridge.